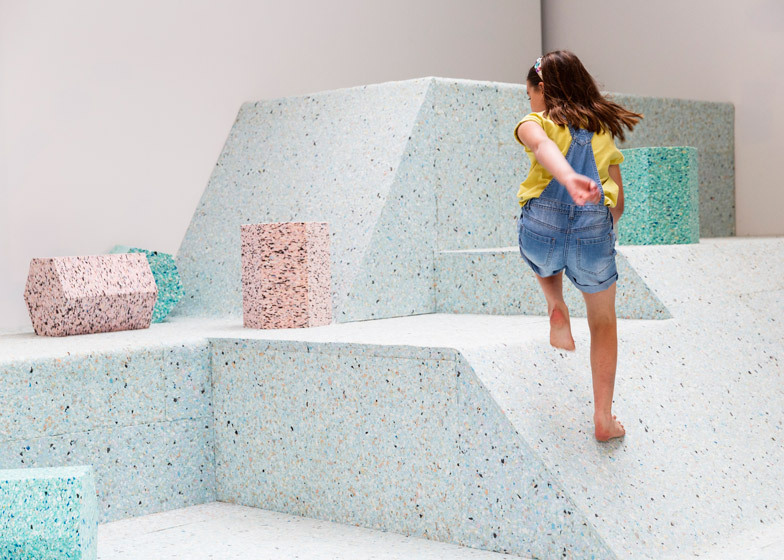 London Festival of Architecture 2015: Turner Prize-nominated architecture collective Assemble has teamed up with British artist Simon Terrill to create full-size foam replicas of playground designs from architecture's Brutalist era (+ slideshow). 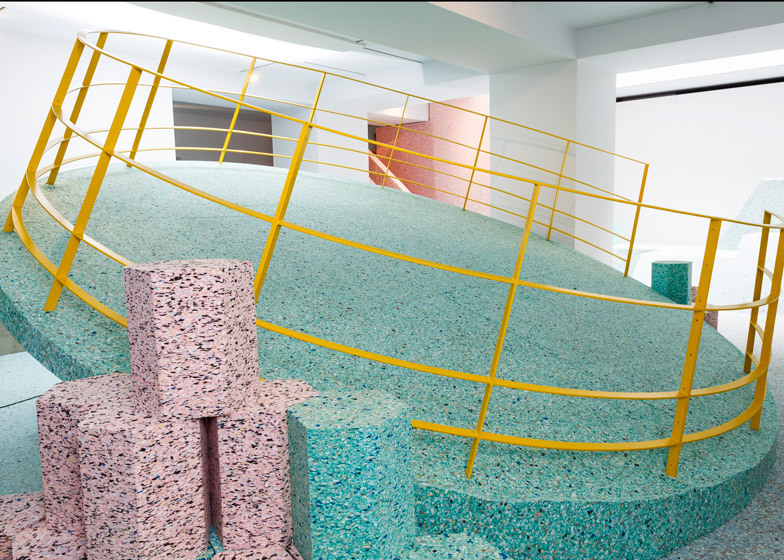 The Brutalist Playground installation fills an entire gallery inside the Royal Institute of British Architects headquarters on Portland Place in central London. 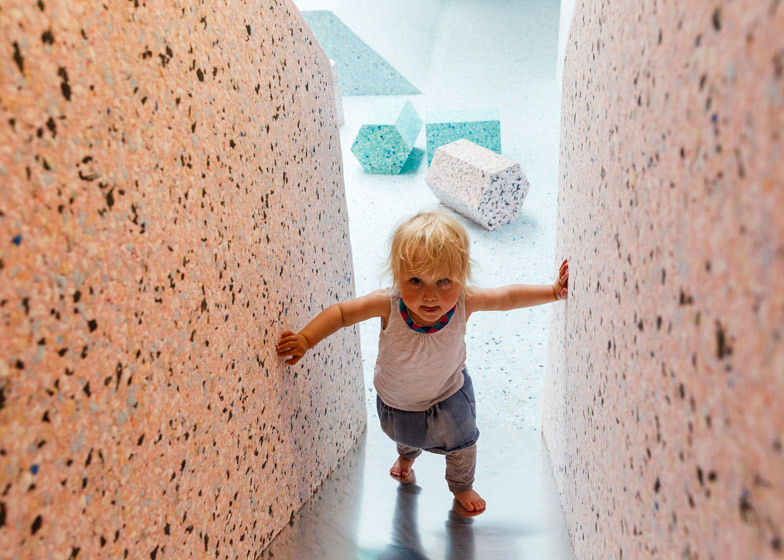 Opening to the public tomorrow, the reconstituted foam landscape created by Assemble and Terrill replicates the shapes of concrete objects in playgrounds that were built to accompany British Brutalist housing blocks in the mid-20th century. 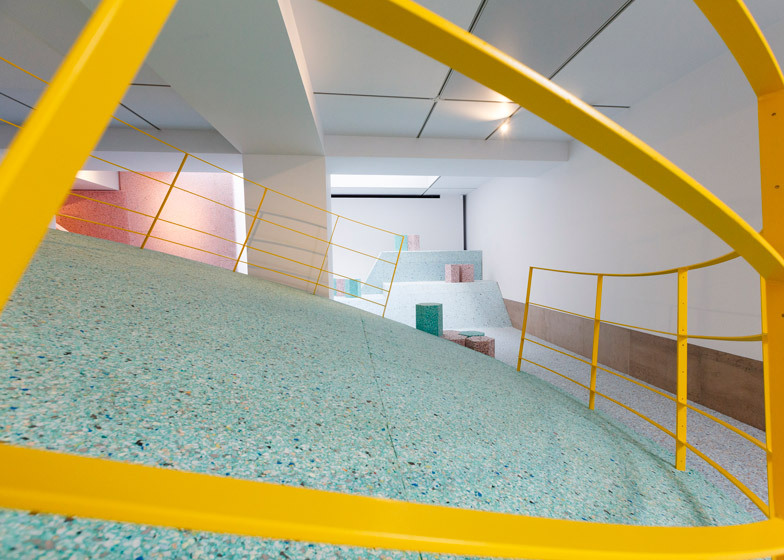 Visitors can climb on the pastel pink, blue and green objects, which form stairs, slopes, platforms and a slide, as well as a large disc with a yellow metal balustrade that is elevated at one end. 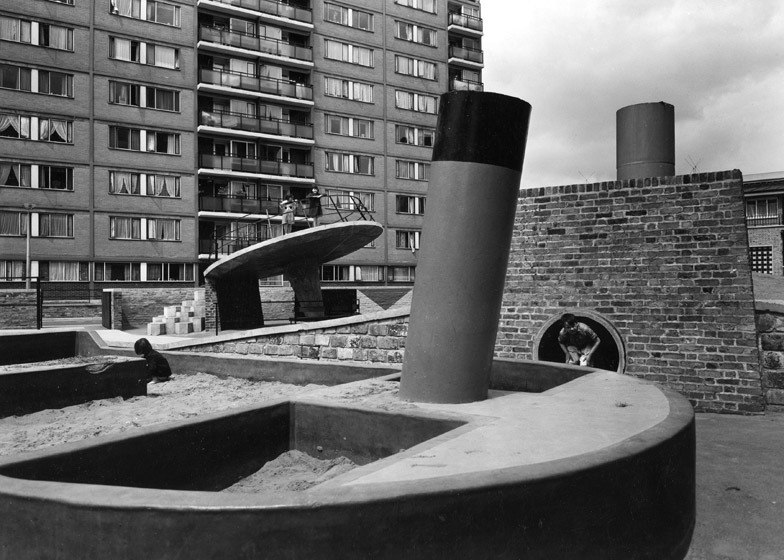 The original playgrounds were largely demolished, but Terrill found archive images in the RIBA's library that inspired the exhibition. 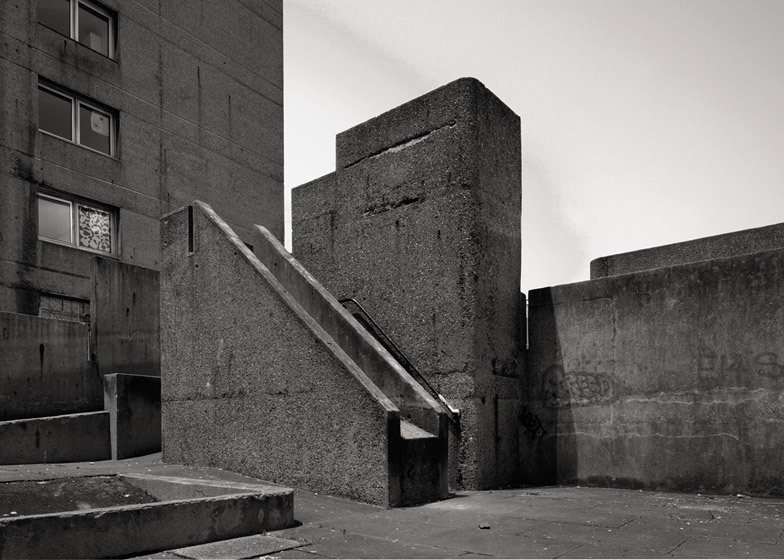 "Simon got in touch with us and the description started around the title, Brutalist Playground, and these images that Simon unearthed from the RIBA archive," Joe Halligan, one of the members of the Assemble collective, told Dezeen. 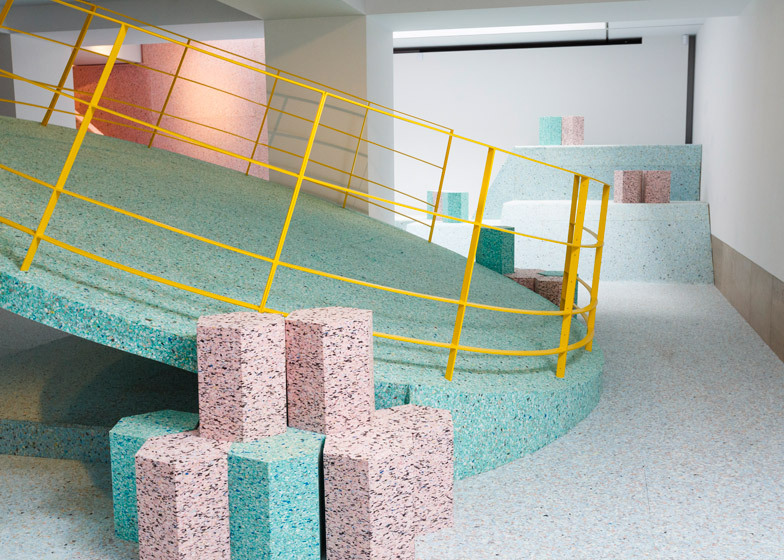 "These surreal, concrete, Brutalist playgrounds looked very risky." 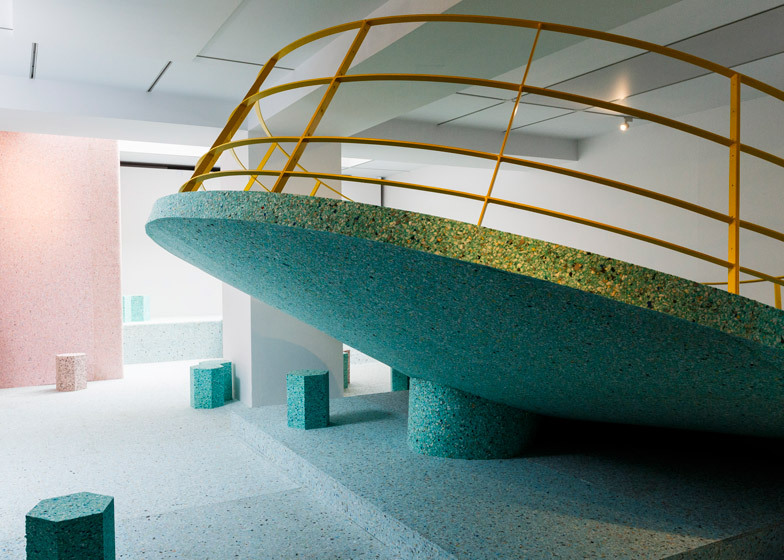 A lookout platform that extends through the ceiling, offering views out of the gallery's glass roof, is a recreation of part of the playground at the base of the Balfron Tower, designed by Erno Goldfinger in north west London – one of the only original designs still in situ. 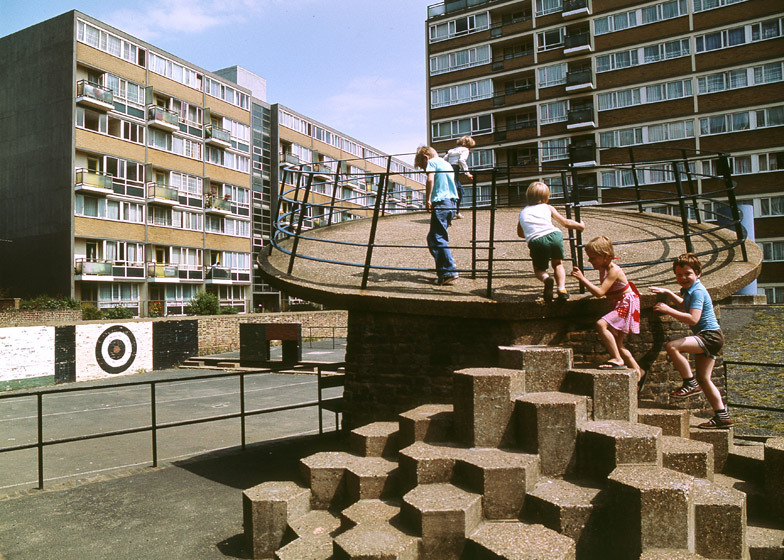 The five-metre-wide disc was originally seen in the playground at the Churchill Gardens Estate in Pimlico, and freestanding hexagonal blocks are based on concrete steps from the same location. 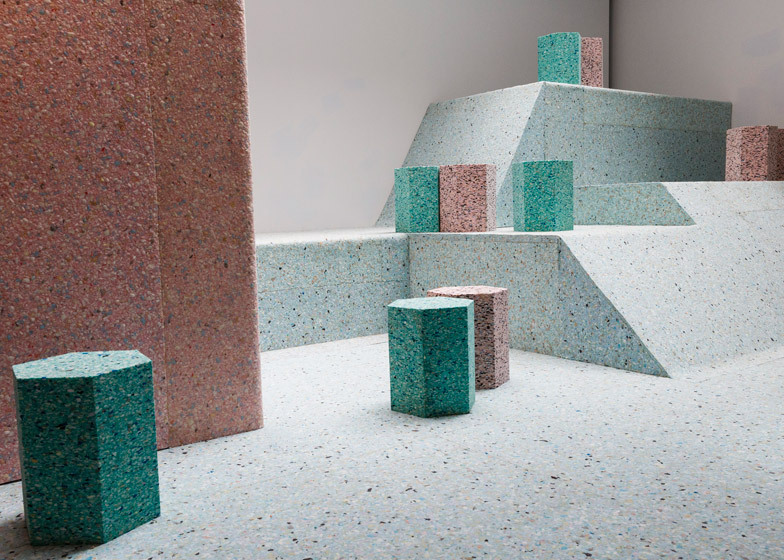 "Some of the objects are too big for the gallery and that's something we wanted to emphasise – that these original pieces of landscape within these Brutalist estates were huge," explained Halligan. 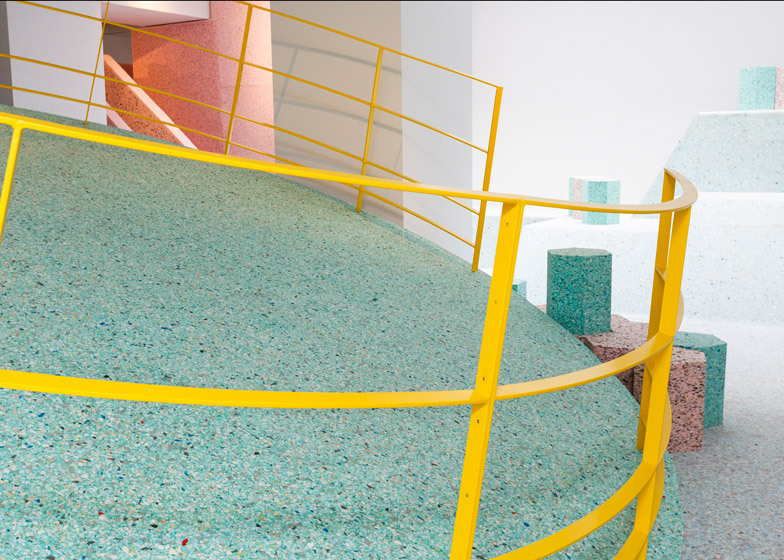 Larger pieces in the installation were created from steel or wood off-site and covered with different densities of the reconstituted foam, which is made by gluing together recycled offcuts from other foam materials. Smaller pieces are solid foam. 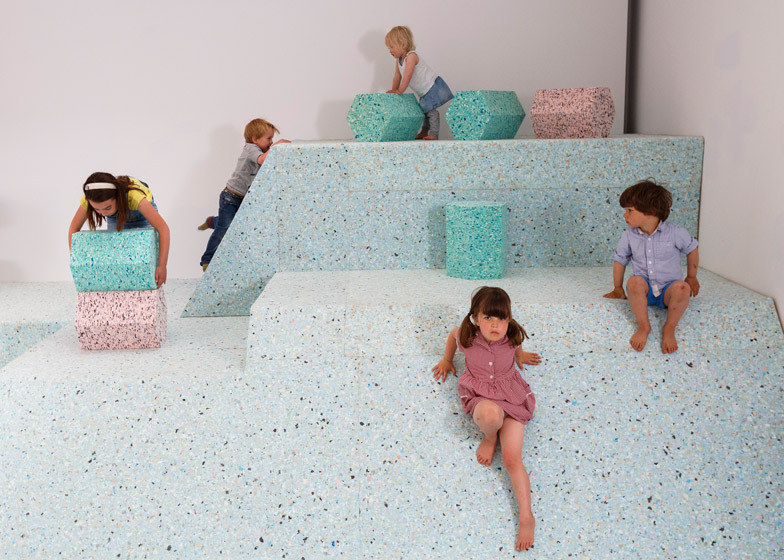 Recreating the shapes of the playground equipment in another material is partly a reference to the Victorian habit of casting – travelling the world to create plaster casts of important pieces of architecture to display in British collections and museums like the V&A. "That's almost enough of a gesture to show that these things are important and shouldn't be forgotten," said Halligan. 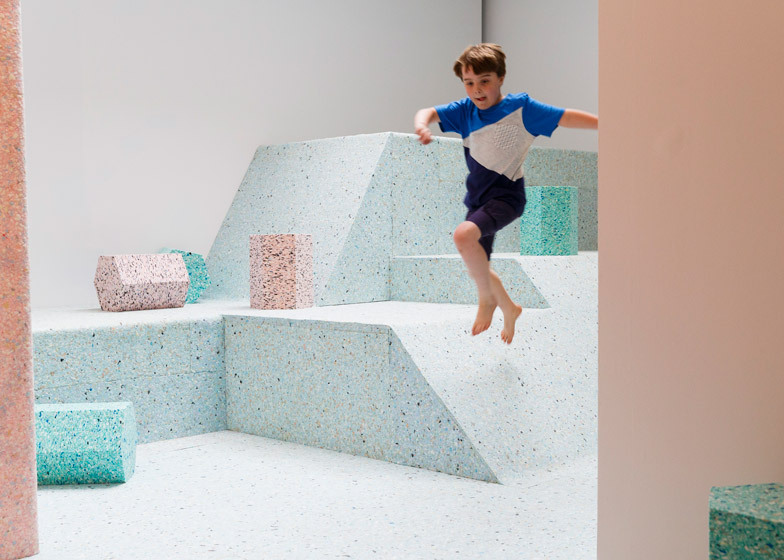 By replicating the shapes in foam – a material commonly found in indoor playgrounds – Assemble and Terrill also intended to raise questions about the way children are encouraged to play today. "That translation is trying to question whether or not risk in play is a totally bad thing," said Halligan. "The idea that a child can fall off a tree and hurt themselves and that graze on the knee might last a week, but it might also shape their view or make learn a little bit about how they balance themselves. 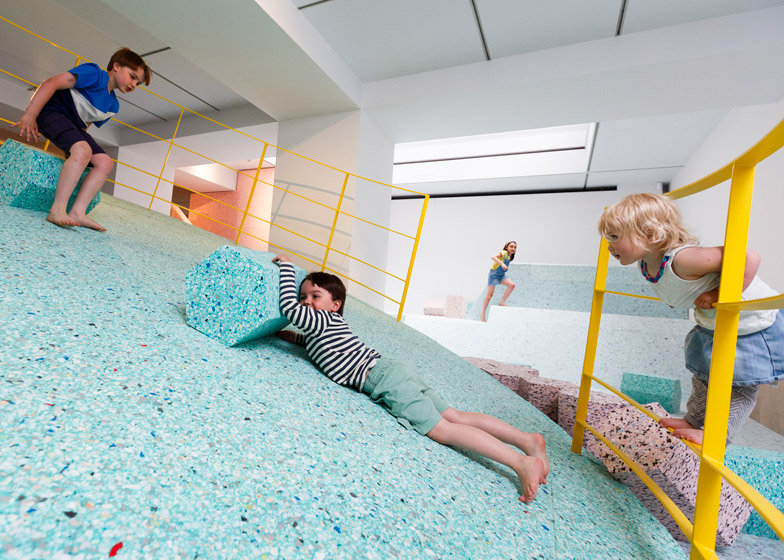 And the idea of taking that away, cushioning it and making it soft and kind of dumbing it down for kids, making everything primary colours." 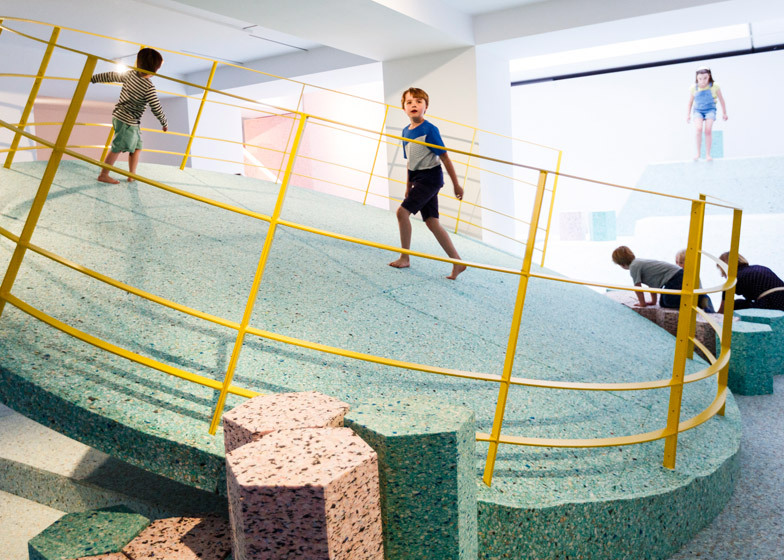 Brutalist Playground runs from 10 June to 16 August at the RIBA's Architecture Gallery, Portland Place, London.